First off, I hope everyone had (and continues to have) a wonderful Holiday Season. About 10 years ago, I was working a wine event and, among the dozen or so Italian wines that were being served, was the Barbera d'Alba Regiaveja of Gianfranco Bovio. I'd had the wine many times in more recent vintages (which, at the time, were, say, 2004, 2005 etc. ), and was always a fan. But what made the bottle being served that night stand out was the vintage - it was the 1996. I had opened the bottle right before the event started and quickly tasted it. It was lovely, but it very tightly wound and quite restrained - in other words, it was very 1996. He was very low-key about it. In fact, I'm quite sure he wanted to make sure that few people, if any, were clued in on what he was enjoying. Finally, when I had a free moment, I decided I had to see what he was up to. I poured myself a taste and was immediately shaken out of 'work mode' and right into 'appreciation mode'. I had never experienced a Barbera with such a kaleidoscopic bouquet, such unending complexity, such energy - and honestly it was going nowhere fast. It had such a great backbone of acidity that, were you able to find one today, I imagine it would still be singing. To this day, it remains one of the single greatest glasses of mature Barbera that I've had and, being such a big proponent of aging classic Barbera, I've had my fair share - Giacomo Conterno, Bartolo Mascarello, Cappellano, Trinchero, Giuseppe Rinaldi, etc. I can't recall a single one that offered as much varietal expression as this '96 Regiaveja. 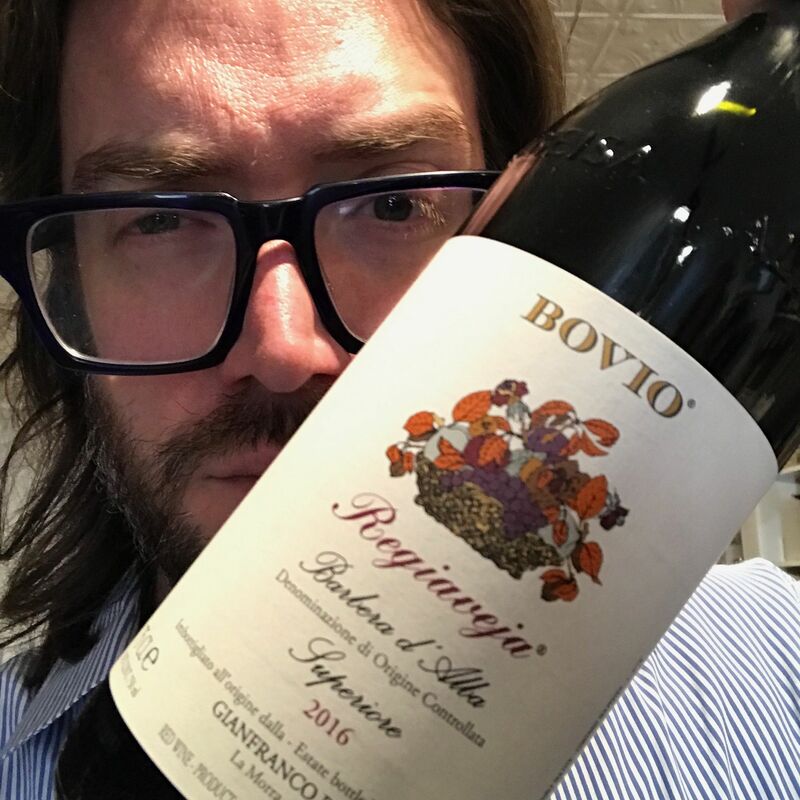 Anyway, the point is that a) Barbera is awesome and ages beautifully (for the umpteenth time in this newsletter) and b) Bovio's Regiaveja is one of the true unsung gems. As much as I love Bovio's Barolos, I find the Regiaveja to be the most exciting wine in their lineup. The second part of this 'saga', if you will, is that Bovio was one of Robert Chadderdon's producers, the famous importer who retired a few years back. So Bovio was basically out of the market for a while, but finally resurfaced earlier this year with an importer who I do some decent business with. FFwd to a couple of weeks ago and he brought by a sample of the 2016 and...well, holy smokes! This 2016 is the best of all worlds - it's weighty and rich, but it's also blazingly bright, leaning heavily on the red-fruit side of the barbera spectrum. The generous, berry fruits are well defined and interwoven with all kinds of herbaceous/earthy/mineral/spicy nuances. The vigorous acidic structure on the finish balances the whole thing out perfectly. This wine is going to offer beautiful drinking from the time you receive it until at least its 20th birthday, changing all along the way. It's a stunner and I'm really, really excited that it's back. Just to drive the point home, I happened upon a lone bottle of the 2001 Regiaveja (a vintage that tasted a lot like this 2016 in its youth) the other week and Emily and I enjoyed it alongside a dish of mixed mushrooms from our farmer's market sautéed in butter and tossed with pasta and Parmigiano Reggiano. This is yet another example of how you can still cellar wines and be greatly rewarded without spending a lot.